[M]ost of those who have grown to know and love our country's history have travelled that path guided by heritage buildings that were the gateways to the stories of the past. The most interesting heritage discussion in Canada right now is going on in Ottawa — in the House of Commons! The bill was introduced in Parliament late last year by Peter Van Loan, MP for the Ontario riding of York—Simcoe and Official Opposition Critic for Canadian Heritage and National Historic Sites. For background on the bill see my OHA+M post from December 21, 2016. Leaving aside for the moment consideration of the bill itself, it is wonderful to see our representatives, from all three major parties, engaged in a passionate discussion of the importance of our cultural heritage. These [historic] buildings tell a story about who we are and where we came from. They impart important lessons from the past and remind us about the challenges we have overcome and the accomplishments we have had in this country. In short, they highlight and bring to life those special moments in our history that are worth remembering. As a private member’s initiative, the bill faces an uphill climb. As a measure amending the Income Tax Act and affecting government revenues, that climb is especially steep. At Second Reading a bill is discussed at a high level, with MPs weighing in on whether the concept or principle of the legislation should be supported. More rigorous scrutiny of the details of the bill comes — if it comes at all — later, when the bill moves on to the committee stage. Considering that the fate of the bill is in the hands of the Liberal government, one would have to say… there is still reason to hope. New Democrats have long supported Canadian heritage and we support the goal of this private member's bill of preserving historic stock. … This legislation would help to clear the path for the creation of good green jobs; jobs that are stable, safe, and family-supporting; jobs that do not endanger the climate or the environment; and jobs that help us in the gradual transition away from reliance on fossil fuels. Both these points seem to suggest that, in the eyes of the government, the timing of the bill is not great. One might observe that less-than-ideal timing of a bill should not be a fatal flaw. Nor should specific policy and administrative criticisms and concerns, if they can be countered, fixed through amendments or addressed through implementation planning. Across the country, Canada's built heritage reminds us of where we came from and where we have been along the way. From the smallest rural towns to our grandest cities, the history contained within these buildings forms what it means to call our communities home. Remarkably, a month later during the continuation of Second Reading debate on March 9, all MPs spoke forcefully in support of the bill. It is indeed, as those addresses indicate, a non-partisan bill. This is not a partisan effort. It is very much a product of the work of previous governments, both Liberal and Conservative, under which the foundations of this tax credit have been developed in this proposal, and it is a benefit to all of Canada. That is why all of us are indeed advocating for it. He then went on to address some of the criticisms voiced on February 10. He punctured the inequality argument, saying that what was unfair was that private owners of designated properties were effectively providing a public benefit with little/no help. With respect to the need for the measure, he pointed out that existing tax rules may benefit donations to preservation charities but not the preservation efforts of private businesses and individuals. What’s next? Second Reading debate is concluded and the vote is scheduled for March 22. If the bill isn’t killed, it’s on to committee! There are many beautiful older buildings in my riding…. In fact, my Wellington county constituency office is in one such heritage building. It is a beautiful old post office. It was the Harriston town post office for many years. … Shortly after I was elected, I was able to take a tour of the building and to see the state of repair it was in at the time. Thanks to a hard-working local family, it took ownership of the old post office and restored it to an exceptionally high level of standard. Now my constituency office in Wellington county is located in that building. It has been renamed the “Old Post” and is now home to a number of different local businesses and community groups. I am proud to have played a small role in the restoration of that building. It was no surprise that Mr. Nater is backing Bill C-323. He had assured me as much in his reply to my letter urging his support. Have you written to your MP? If not, this is the time! 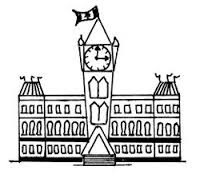 Note 1: See Hansard for February 10 (first hour) and March 9, 2017 (second hour) and scroll down to Private Members’ Business. Note 2: Part of the case for the tax credits is that, while they reduce income tax for the taxpayer in the year of filing, over time there is a more-than-offsetting increase in tax revenue as a result of the returns on investment they stimulate. This argument is sounder in the case of a commercial, income-producing rehabilitation project than for a home restoration. Note 3: Less clearly, Mr. Van Loan suggested that the government would have some control over the number of properties eligible for a tax credit since only properties on the Canadian Register of Historic Places qualify. In fact, under his bill properties designated under the Ontario Heritage Act and similar legislation could also be eligible.